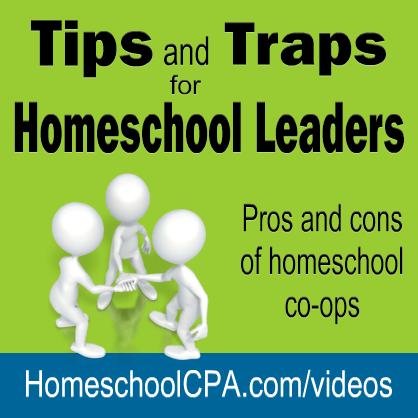 In this video I discuss the pros and cons of leading a homeschool co-op and your responsibility as its leader. I presented as workshop called “Homeschool Co-ops Are Like Marriage: Know What You’re Getting Into” at the Midwest Homeschool Convention in Cincinnati this year. What tax exempt is and how to get it for your homeschool co-op! Required IRS reports that every homeschool organization needs to file. What to do if your group has not filed the required IRS forms. Homeschool co-ops being under a church. Here’s a handout for the presentation. More clips from this presentation can be found at HomeschoolCPA’s YouTube Channel. This is Part 6 of 7 is titled “Nonprofit Status for Homeschool Co-ops. I explain what it takes to be considered a nonprofit and that nonprofit status does not mean tax free (or tax exempt as the IRS calls it)! Are you in a homeschool co-op or thinking about leading one? I have some advice for you! (I even write a book about homeschool co-ops!). Here’s a video clip from my recent presentation of Homeschool Co-ops Are Like Marriage: Know What You’re Getting Into given at the Midwest Great Homeschool Convention in 2014. Part 5 is titled 3 Tools for Running a Successful Homeschool Co-op. In the video I mentioned my book Homeschool Co-ops: How to Start Them, Run Them and Not Burn Out. If you’re in a homeschool co-op or leading one, I have some advice for you! (I even write a book about homeschool co-ops!). Part 4 is titled 3 Important Things to Remember About Homeschool Co-ops. I also created this handout for the presentation. 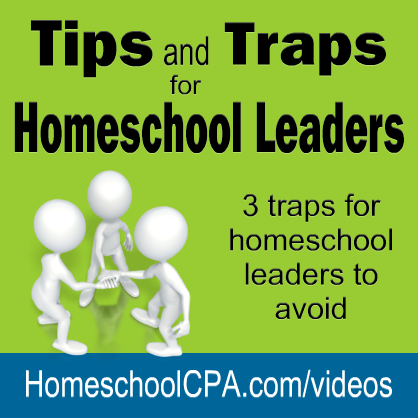 Watch the other portions of the presentation on HomeschoolCPA’s YouTube Channel. Ever thought about starting a homeschool co-ops? I’ve got a book that will help! Here’s a clip from my recent presentation of Homeschool Co-ops Are Like Marriage: Know What You’re Getting Into given at the Midwest Great Homeschool Convention in 2014. I love and encourage homeschool co-ops (I even write a book about them! ), but, like marriage, it’s best if you know the disadvantages of joining a homeschool co-op.